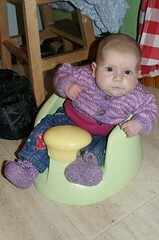 Daddy found this cool armchair for babies in the cupboard the other day. It must have belonged to Anna and Léon. I can watch what everyone is up to now which is fascinating.